Israeli Prime Minister Benjamin Netanyahu made it clear in a March 5, 2012, White House meeting with President Obama, and subsequent remarks to American lawmakers and a powerful Jewish interest group, that his government is growing impatient with Iran's suspect nuclear program. Israel is adamant that intelligence shows Iran is working behind closed doors at nuclear research labs, underground bunkers and military installations across the country to try to develop a nuclear weapon. At least some members of the U.S. intelligence community agree. Iran's Islamic cleric-led government insists their nuclear program is strictly for the production of electricity and medical isotopes. For more than a decade, the United Nations' nuclear monitoring agency, the International Atomic Energy Agency (IAEA), has fought for access to Iranian facilities where intelligence suggests work possibly linked to a secret weapons program. Many sites have been inspected, yielding volumes of technical reports which paint, at best, an ominous but murky picture. There has not been definitive proof Iran is trying to build a nuclear weapon. But on almost every visit, IAEA inspectors leave Iran complaining that the regime allowed them incomplete access or information. Israel - within range of some of Iran's missiles - feels it cannot take a chance with a country which has publicly vowed to destroy it. The Israelis argue a strike should be carried out soon, or it may be too late to prevent Iran developing a nuclear weapons capability. Israel's military has, for fairly obvious reasons, not listed the sites it would try to target in a preemptive strike on Iran. However, public knowledge of Iran's nuclear and military installations and past reports from IAEA inspections sheds light on some likely locations. What follows is a look at those theoretical targets and some of the other sites vital to Iran's nuclear program. The list has not been and is unlikely to ever be confirmed by either Israeli or U.S. officials. It also does not include myriad manufacturing locations across the country where Iran produces the components for its enrichment process, or research and development sites which are unknown or unconfirmed by the IAEA. It also excludes the conventional military installations and missile facilities around the Islamic Republic that Israel may try to incapacitate in any preemptive strike. The existence of this uranium enrichment facility was only confirmed by Iran in 2009. At the time it was empty, but since the summer of 2011, Iran has been transferring centrifuges to the site, which is buried almost 300 feet beneath a mountain and is protected by significant air defenses. Israel and the U.S. think it's likely that if Iran were to try and start making uranium enriched to weapons-grade (greater than 90 percent enrichment), they'd do it at Fordo, as it is their best-protected enrichment site. Paul Brannan, a senior analyst at the Institute for Science and International Security, says Iran likely designed and built Fordo to be the "breakout" facility - where their ostensibly civilian nuclear program would quietly push forward into the weapons development realm. Fordo is "obviously for nuclear weapons hedging, to preserve centrifuges in case of an attack" on other, more vulnerable facilities, adds Mark Fitzpatrick, an expert on Iran's nuclear program and the director of the nonproliferation and disarmament program at the London-based International Institute for Strategic Studies. Fordo was only built to hold 3,000 centrifuges - not enough for a nuclear power program, but enough for a nuclear weapons program. The centrifuges at Fordo are currently producing uranium enriched to 19.75 percent, which is used for medical purposes, according to the Iranian government. It is not that much of a jump, though, says Brannan, to take that low-enriched uranium (LEU - considered anything under 20 percent enrichment) and turn it into high-enriched uranium (HEU - anything greater than 20 percent enrichment). Fitzpatrick explains that any HEU can be useful to a weapons program, but to really be considered efficient enough for use in a warhead, uranium must be enriched to about 90 percent - what is considered weapons-grade. It's believed that Iran is producing and stockpiling increasing amounts of 19.75 percent enriched LEU at Fordo. The IAEA's most recent report, in February 2012, cited the installation of some 700 new centrifuges at Fordo, but they appear to be missing rotors - a key component - which leads experts to doubt the Iranians actually have an increased enrichment capacity at the facility. Nonetheless, Fordo's heavy fortifications brought the site to the forefront of discussion as rumors of a possible Israeli strike swirled. CBS News national security correspondent David Martin reports that not even America's most powerful conventional weapon - a 30,000-pound bunker buster bomb - can penetrate deep enough to destroy the Fordo complex. However, U.S. military commanders say it would likely be possible to render Fordo unusable - at least temporarily - by sealing off the underground chamber with strikes on the entrances and on the ventilation system, which is external. The lack of defenses at the Natanz fuel enrichment plants make it an easier target than the well-fortified Fordo facility, but an assault on the Natanz plants would reap much less of a reward. The bulk of Iran's centrifuges operate in Natanz, with about 9,000 spinning at present, according to the IAEA. It was designed to hold 50,000 centrifuges, the amount required to enrich uranium for a nuclear power program. Some of the uranium coming from the Natanz plants is enriched to 19.75 percent - very near the 20 percent tipping point - making it a likely target for an air strike. All of the 19.75 percent enriched uranium is made at an above-ground pilot plant at Natanz, while the rest, enriched to about 3.75 percent, is produced at the underground fuel enrichment plant on the site. Brannan, of the ISIS, says neither facility is particularly well protected from an aerial strike - a significant difference between Natanz and Fordo. An assault on Natanz with conventional military weapons wouldn't be the first attack on the facility. As CBS News' "60 Minutes" reported in early March, a computer virus called Stuxnet was launched against the facility several years ago, almost certainly with some U.S. involvement. The uranium conversion facility at Esfahan is the only known location where Iran is capable of converting its domestic supply of raw yellowcake uranium into hexafluoride gas - the feedstock for the centrifuges at Natanz, Fordo and other facilities. While destroying the facility at Esfahan would impact the Iranians' ability to keep feeding their enrichment work at Fordo and Natanz, Brannan says the Iranians have mastered the technology involved and could therefore repair or rebuild with relative ease a new processing facility after any attack. Esfahan, built in 2006, still remains an attractive target due to its stockpiles of hexafluoride gas and raw yellowcake uranium. Fitzpatrick notes, however, that those materials are stored in a long underground cavern or tunnel at the facility, and the more valuable hexafluoride gas is stored in small, easy to move canisters, so targeting those stocks would difficult. It is likely Iran has stored some hexafluoride at Natanz and Fordo, also, as it serves as the fuel for the centrifuges at those facilities. Revealed in 2002, the heavy water reactor in Arak remains under construction, according to the IAEA. Based on its design, Iran could eventually use the facility to produce weapons-grade plutonium - something it currently cannot do - which would be a major worry for Israel and the United States. But there are major hurdles the Iranians must first clear. Iran was hoping to have the reactor finished as early as 2013, but, with ever-tightening international sanctions making it difficult for the Iranians to obtain materials from abroad, it's unclear how long it could take for the reactor to be made functional. Fitzpatrick, at the IISS, says 2014 now seems more likely, but still uncertain. If and when it is completed, Arak could theoretically make enough plutonium by reprocessing spent fuel from the reactor to arm one, possibly even two nuclear weapons per year. The reprocessing of spent plutonium fuel represents another hurdle. Iran currently has no reprocessing facilities to carry out that work. Fitzpatrick says there is no indication Iran is working to build such a facility, either, so if Iran does hope to produce weapons-grade plutonium, they are not making fast progress in that direction. Regardless of how far down the road Arak's potential advent is, the specter of Iran creating its own supply of weapons-grade plutonium would likely be sufficient impetus for Israel to put the facility in its sights, should a preemptive strike be ordered. The Parchin military complex remains on the IAEA's wish-list of inspection sites. 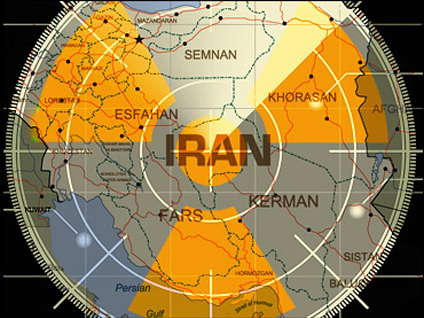 Suspicion that the site was involved in clandestine nuclear weapons testing work piqued in early March, when satellite imagery showed apparent earth-moving vehicles at Parchin - equipment that suggested the Iranians might be trying to clean the site of traces of radiation in the soil. Fitzpatrick, however, says that while Parchin "very probably" was home to nuclear-related experiments, and, "Iran very probably is trying to cover up evidence," there is little to suggest any nuclear materials were ever there. Instead, it's widely believed that the site may have been used to test explosives of the sort necessary to detonate nuclear weapons. That suspicion was drawn based on images showing a reinforced building at the site, surrounded by apparent earth berms, where test explosions could have been conducted at a safe distance from nuclear materials. Iran's Foreign Ministry spokesman Ramin Mehmanparast denied a claim by two diplomats to that effect, insisting Parchin's activities were related to "conventional military" operations. He also dismissed the notion that there was any cleanup, arguing that "nuclear military activities are not cleanable at all." Iran had rebuffed the U.N. nuclear agency's requests to inspect the facility, but then in early March Tehran offered a visit - subject to planning and unspecified guidelines. An IAEA official told the Associated Press there hadn't been any further information from the Iranians on an inspection of Parchin as of March 13. Fitzpatrick notes that, with no indications nuclear-related work has been carried out at Parchin for many years, it is unlikely to be considered a valuable target by Israel or the United States. The Tehran Research Reactor at the Tehran Nuclear Research Center is often cited by Iran as the reason it's enriching uranium at nearly 20 percent - not to make weapons, but to conduct research, says Brannan, of the ISIS. The reactor stands as an investment gone bad for the United States, which helped Iran build it in 1967, before the 1979 revolution that brought the Islamists to power and severed ties with America. Before the revolution, the Iranians were also supplied with weapons-grade uranium to fuel the reactor, but much of it was converted back down to a much lower enrichment level for the Iranians by Argentina in the 1980s. Brannan says it's believed that LEU has been powering the reactor since that time. Due to the research center's largely civilian nuclear research purposes, and its location in the heart of downtown Tehran - surrounded by thousands of civilians, it seems an unlikely target for any preemptive strike. Fitzpatrick, of the IISS, says the center does not represent a "proliferation threat." It remains, however, a key location for research in Iran's nuclear program. In 2007, the Defense Industries Organization in northern Tehran was accused by the State Department of "engaging in activities that have materially contributed to the development of Iran's nuclear and missile programs" and was designated under an executive order aimed at "proliferators of weapons of mass destruction" and their supporters. It's essentially a manufacturing base for the military, according to Brannan. The IAEA last visited DIO sites in 2005. The various DIO plants are thought to have been where many of Iran's centrifuges were built, but Fitzpatrick says nobody genuinely has a good fix on where that hardware might be produced today. He stresses there are big questions over Iran's capability to produce key enrichment hardware at all right now - with the lack of rotors for centrifuges at Fordo and Natanz fueling doubt.